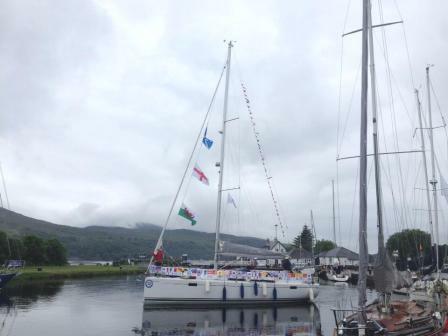 Jonathon and James Backhouse, along with Rob Hindle of the Westholme Warriors, completed their final sail yesterday from Whitehaven to just north of Fort William in Corpach at 20.25pm. The runners Stuart Lewis and Andrew Holland finally got to at least start their 3rd and final run in daylight up Ben Nevis, which they had completed by about 1.00am. Mean while the rest of the team had already enjoyed a relaxing celebratory drink or two in the bar! 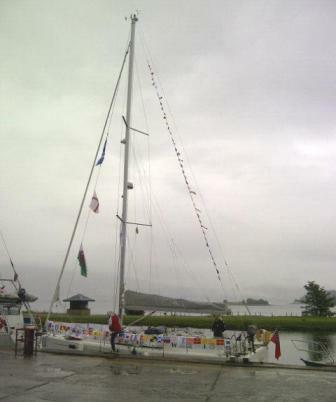 So, they have all finally completed the 3 Peaks Yacht Race Challenge from Barmouth to Fort William. They have sailed or rowed! approximately 389 nautical miles, risking sandbanks, rocks and fierce tides. Having had very little rest as the race is continuous. The two runners in the team have completed 72 miles of running with 14,000 feet of climbing to reach the summits of Snowdon in Wales, Scafell Pike in England and Ben Nevis in Scotland. This included the 13 mile cycle ride at both the start and finish of the route to Scafell Pike, which is the longest and probably most difficult, land leg in the race. This is no easy task when they have to run at night, unsteady on their feet due to sea sickness and having had little sleep. Former pupils, Claire Grindrod and boyfriend James McKie have been helping them all week. Following on land by car to meet them generally in the middle of the night, with equipment, refreshments and lots of cheering on. So thanks so much to them both for all their hard work as well! This morning the team will have to sail back to Oban, where the boat will stay for now and then Claire and James will yet again meet them there to bring them all back home probably late tonight. Well done to the Westholme Warriors! 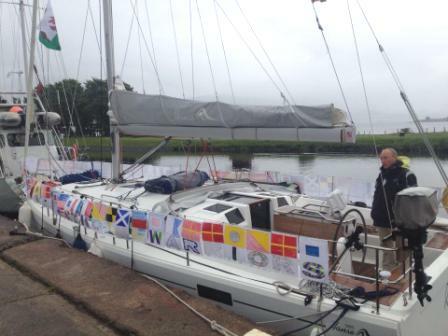 The Warriors had the flags of Wales, England and Scotland flying, in that order as that is how it is done in the race, and promised they would dress their boat for the morning. (There is a trophy for that given by the water board and judged by the Lock Keepers.) They were true to their word and in the morning the yacht had the whole rail decked out with artwork from the children at Westholme School. Each one had a letter and the corresponding signal flag, carefully decorated, and they spelt out Westholme Warriors along the rail twice on each side. It made for a colourful display!